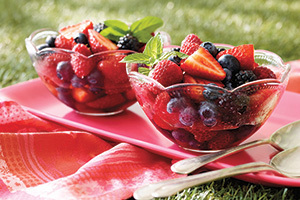 Fresh berries are one of Ontario's sweetest pleasures. They need little embellishment (if any!). Here they've been gently tossed with a mint ginger syrup to enhance their flavour. Fruit and syrup can be prepared the night before, covered and refrigerated. Toss just before serving.